Set up a coffee meeting to discuss your potential match with our exciting and demanding E-MBA! Some cities on our fall travel schedule include Dubai, Budapest, and Prague. The Global Executive MBA programme is an intensive and rewarding executive education experience. You will study 11 one-week modules over the course of 20 months, with teaching taking place on four continents. Join us and a cross-section of senior international executives on a curriculum of discovery and management excellence. The Global Executive MBA will enable you to explore your organisation from differing viewpoints so that you can truly appreciate its international position, and become acquainted with diverse business practices from the four corners of the globe. You will be challenged on a professional and personal level, create room for innovation within your organisation and be exposed to the very latest business practices from around the globe. You will explore and analyse the success factors behind effective leadership, learn about innovation and entrepreneurship, boost your financial strategy skills, and further your knowledge within the field of CSR and sustainability. Cases identified in your own organisation will serve as your assignments and semester projects, ensuring immediate ROI and maximising your time out of the office. 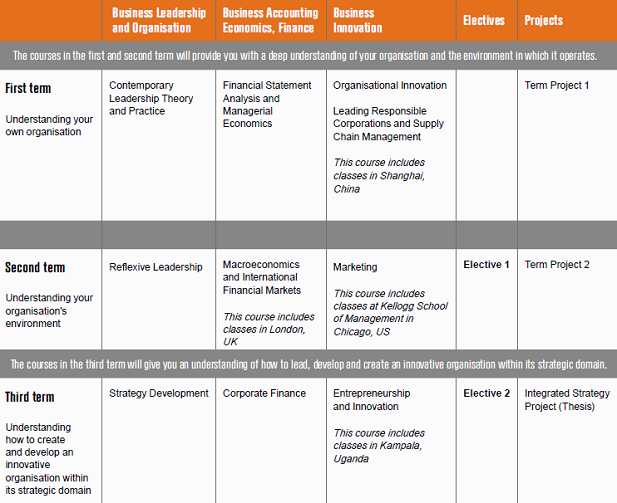 Classes take place over 11 one-week modules in Copenhagen, London, Chicago, Shanghai and Kampala. The programme starts every year in September and the tuition fee for the Global Executive MBA is 425,000DKK, payable in three instalments. If you are interested in joining the next class of talented executives, contact admissions manager Thuli Skosana for more information. Information about the selection process, the expected ROI for your organisation and what you need to include in your application. Projects and assignments are applicable to your own organisation, ensuring ROI for your employer and prompting you to apply your MBA learnings to real strategic challenges. Discover benefits gained for sponsoring organisations and participating employees here. Discover your fellow participants that will become your peers and MBA network here. All participants have been carefully screened and vetted before admission, and you will be part of a group of executives from various backgrounds who will all add different perspectives to classroom discussions. Classes are kept deliberately small in order to facilitate networking, group work and to increase your one-on- one time with faculty. From the very first day of classes you will become part of the CBS MBA alumni network, comprising 1,500 graduates of 80 nationalities; the biggest MBA network in Scandinavia. Learn more about our inspiring executive learning environment. There is ample opportunity during the CBS Global EMBA to add value to your current organisation as projects are applicable to your own organisation. Therefore, a large percentage of students explore employer sponsorship as means to finance or partly finance the degree. If you are a Danish national (or employed in Denmark), you can explore the possibility of financing your CBS Executive MBA via salary deductions at source (known as bruttolønsordninger, lønomlægning or fleksibel lønpakke). Students from the United States at Copenhagen Business School is approved for loans by Sallie Mae. Contact them about the "Smart Option Student Loan" - up to the amount of $45,500.